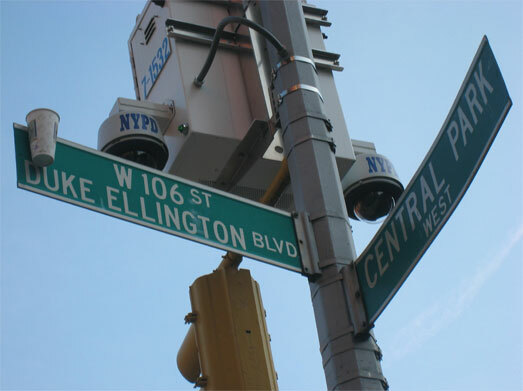 Clarinetist Ike Morphy, his dog Herbie Mann, and a pair of pigeons who roost on his air conditioner are about to be evicted from their apartment on West 106th Street, also known as Duke Ellington Boulevard. Ike has never had a lease, just a handshake agreement with the recently deceased landlord; and now that landlord’s son stands to make a killing on apartment 2B. Centering on the fate of one apartment before, during, and after the height of New York’s real estate boom, Ellington Boulevard’s characters include the Tenant and His Dog; the Landlord, a recovered alcoholic and womanizer who has newly found Judaism and a wife half his age; the Broker, an out-of-work actor whose new profession finally allows him to afford theater tickets he has no time to use; the Broker’s New Boyfriend, a second-rate actor who composes a musical about the sale of 2B (“Is there no one I can lien on if this boom goes bust?”). There’s also the Buyer, a trusting young editor at a dying cultural magazine, who falls in love with the Tenant; the Buyer’s Husband, a disaffected graduate student taken to writing bawdy faux-academic papers; and the Buyer’s Husband’s Girlfriend, a children’s book writer with a tragic past. With the humor and poignancy that made Langer’s first novel, Crossing California, a favorite book of the year among critics across the country, Ellington Boulevard is an ode to New York. It’s the story of why people come to a city they can’t afford, take jobs they despise, sacrifice love, find love, and eventually become the people they never thought they’d be—for better and for worse. Mortgage Broker: So what sort of books do you write? Me: I guess you could call them literary fiction. Looking back, it’s hard for me to imagine a more eventful and life-changing year than 2005. In June, I became a dad; five months later, I lost my own father. In 2005, my wife and I also became homeowners, an event that was hastened by an incident that occurred at the very beginning of the year. My wife, who was three months pregnant, and I had been walking our dog around the North Lawn of Central Park on one of the coldest days of the winter. We exited the park at Strangers’ Gate, then walked a block and a half west to the apartment on Duke Ellington Boulevard where we’d been living for approximately five years. Our neighborhood, known variously as Manhattan Valley, the Upper Upper West Side, and South Harlem, was experiencing massive gentrification. The New York real estate scene had exploded, and I was aware that we would soon be unable to afford to live in our apartment. While writing my first two novels, with the benefit of hindsight I had examined changes that had occurred in my old neighborhood in Chicago during the late 1970’s and 80’s. Now, I was watching up-close as another community was transforming—long-time residents and business owners were being forced out by rising rents; homeowners were making profits they could never have anticipated. Throughout the city, everywhere I went, conversations focused on real estate. My landlord had owned our apartment, a pleasant-but-by-no-means-luxurious two-bedroom in a five-story walk-up on Ellington (known more commonly as West 106th Street), since 1989; back then, the neighborhood had been a good-deal rougher and an infamous brothel was located just one block east. Now, he was selling for a more than 1,000% profit. My landlord and I were working with a month-to-month agreement sealed with a handshake. With twenty-four hours notice, he and his broker had our permission to show the apartment to prospective buyers. But that night, when we returned to our apartment, the front door was already partly ajar. I opened the door the rest of the way, and saw four people inside—a real estate broker, a young man and woman, and the woman’s father who I later learned would be helping them put a down-payment on an apartment. My dog went berserk, as he tends to do when strangers are in his home. He lunged and snapped until I put him in our bedroom and shut the door. An argument erupted between myself and the real estate broker. I had already written about fifty pages of a new novel. But as weeks passed, that night in January kept returning to me. I imagined numerous scenarios in which a man and his dog return to what they thought was their home only to find it populated by strangers planning to buy it out from under them. And as I criss-crossed the city in search of a new apartment, meeting real estate agents, mortgage brokers, and lawyers, and even completing a real estate brokers’ training course in New York’s Garment District, I began trying to imagine who that man might be, and then imagining the lives of the buyers, the seller, the broker, the owner, even the dog. As I continued to ask myself questions, I began developing characters whose lives were at points of transition, some of which mirrored my own. The soon-to-be-displaced tenant was a clarinet player coping with the recent death of a parent. The young couple placing their bid on the apartment (a graduate student in English literature and a junior editor at a struggling publication) were contemplating parenthood. The broker (an actor who finds his talents better-suited to real estate), the owner (a trust-fund layabout seeking to redeem himself as he enters his forties), the tenant’s dog and the pigeons roosting on the apartment’s conditioner would all find their lives affected in one way or another by the sale. In June of 2005, my daughter Nora was born. In November, my father passed away at the age of eighty. I remember the sense I had returning to sit shiva at the home where my parents had lived together for forty-four years, this sense that the security and feeling of permanence I had once enjoyed there would never return. Two months later, I had completed a draft of a novel entitled Ellington Boulevard, which explores the lives of a series of characters all directly or tangentially involved in the sale of one small and suddenly-valuable apartment on the titular street. The final word of the novel is something I had lost while I was writing it and found after I completed it. By the way, the young couple, whom I had seen on the January night when my wife, my dog, and I returned to our apartment, didn’t buy our place. Perhaps they were scared off by my argument with the broker; another couple bought the place about three months later. My landlord ultimately sold the place. My wife and I found an apartment across the hall. Our new neighbors thankfully turned out to be dog lovers, and our dog seems to enjoy his new apartment about as much as he enjoyed his old one. So, we’re planning to hang onto the place—at least for a little while. I recorded a short trailer for ELLINGTON BOULEVARD that offers some story background, showcases Juliette Borda's excellent cover illustrations, and proves once and for all that my dog walks me rather than visa-versa. At the end of my first two novels, you’ll find glossaries. At the end of this one, you’ll find lyrics for a musical written by Miles Dimmelow and Gigi Malinowski, two characters in ELLINGTON BOULEVARD. After I was done with the novel, I asked two incredibly talented songwriters to put my lyrics to music. Click the link below to hear what they came up with. I narrated this piece, which was produced by Spiegel & Grau. The music is by Adam Rudolph and Moving Pictures Ensemble. Adam lived briefly in my apartment on Ellington Boulevard.